Did you know that the average American sits for 11 hours or more every single day? Think about how much time you spend sitting at work—and it does not have to be in an office. If you are working as a professional driver, sitting behind the wheel literally is your job. Add to that the time you spend commuting, eating, using your computer and watching television. How many hours did you count? Research shows that as many as 300,000 deaths a year could be linked to physical inactivity and poor eating habits. An unhealthy diet and lack of exercise lead to increased risk of heart disease, high blood pressure, obesity, diabetes, and certain types of cancer. Besides, a healthier lifestyle will help you feel better, reduce feelings of depression or anxiety, and keep your body strong—even in areas you might not consciously consider, like your bones and your back. Don’t try to do everything at once. A stern diet and a sudden tough exercise regimen may be unhealthy and are likely to make you lose motivation. Consult your doctor and start making lifestyle changes gradually. This will improve your chances of succeeding. Plan your meal around the Five Food Groups: Vegetables, fruits, grains, dairy, and protein. How much do you need of each? Here are some numbers for you: If you are a 19-50-year-old man, try to eat 3 cups of vegetables, 2 cups of fruit, 3 cups of dairy, 6-6.5 ounces of protein and 3.5-4 ounces of grains every day. If you are a woman of the same age, go for 2.5 cups of vegetables, 1.5-2 cups of fruit, 3 cups of dairy, 5-5.5 ounces of protein and 3 ounces of grain. One slice of bread or half a cup of cooked rice or pasta is equivalent to one ounce of grain. When choosing vegetables, remember that red, orange and dark green veggies are extra healthy. Frozen and canned vegetables are also fine but check that they contain no added salt. Fruit can also be consumed as juice, but be careful. Consuming too much fruit juice can lead to an increase in body fat. One of the many advantages of fruits and vegetables is that they contain no cholesterol at all. When going bread shopping, look out for the whole grains. They contain the entire grain kernel, contrary to refined grains which have been milled to make the texture finer, meaning beneficial components like fiber, iron and vitamin B have been removed. Whole grain options are whole-wheat flour, bulgur, oatmeal, whole cornmeal and brown rice. Choose fat-free or low-fat milk, yogurt, and cheese. If you are lactose intolerant, you can use lactose-free or lower-lactose products or soy milk. If you don’t want to consume dairy at all, leafy greens such as kale are a sure bet to give yourself a calcium boost. Keep your protein lean. Trim the fat from your steak and choose skinless chicken. Processed meats, such as ham and sausages, contain added salt. When browsing the seafood section, look for options rich in omega-3 fatty acids, such as salmon, trout, sardines, anchovies, mackerel and herring. If you are feeling in a party mood, why not go for some Pacific oysters? Ditch the soft drinks and microwave lasagna. Processed foods are loaded with salt, fat and refined sugar—none of which are good for you. By the way, cooking does not have to be complicated or time-consuming. One Google search will generate pages and pages of fast recipes that will produce enough food to last you anywhere from days to a week or more. Think of exercise as something you do every day. Take your dog for a walk. Play outside with your kids. Opt for the stairs. And even take a turn around your home with the vacuum cleaner. You still need your cardio, though. Adults should get either 2.5 hours of moderate-intensity or 1 hour and 15 minutes of vigorous-intensity aerobic activity every week. A moderate activity is brisk walking. Jogging counts as vigorous. Does it sound like a lot? Think about it. Watching Titanic again will take 45 minutes longer than the weekly recommendation for moderate-intensity aerobic activity. Half an hour of fast walking every day Monday through Friday and you are there! Work on your muscles twice a week. You can do this by lifting weights or using your own body weight for resistance (e.g., push-ups). If the gym’s bench press seems scary, maybe try yoga and combine muscle activity and peace of mind. 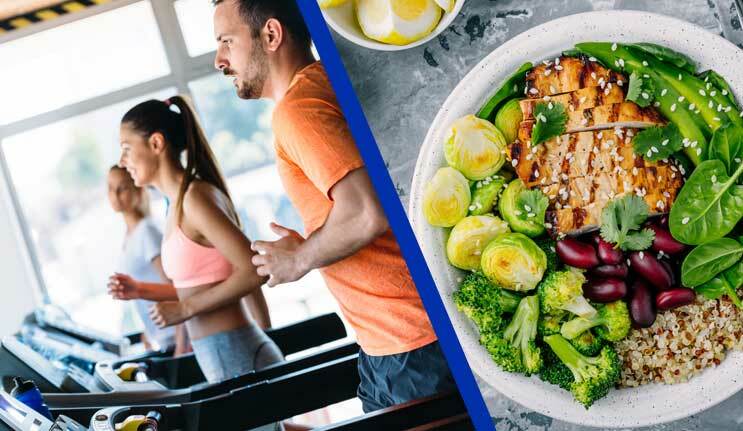 The information for this article comes from the US Department of Health and Human Services, the US Department of Agriculture, the Center for Disease Control and Prevention, and “Diet & Exercise”, an online training course offered by LMS Courses, a Driver’s Alert eLearning company.